The Shark research committee is a non-profit scientific organisation with Its primary focus being Pacific coast White shark behaviour and ecology. Founded by Ralph Collier, SDX has teamed up with the committee on a number of projects in recent years and look forward to many more in years ahead……..
Shark Diving Xperts’ first involvement was when Jimi teamed up with Ralph for the Discovery shark week show “Return of the Great White Serial Killer” beginning a DNA sample study, the first of its kind. Since this first collaboration, together we have run specific scientific research expeditions to the island and in 2017 will be running our third trip together. Ralph and SDX worked together during the study and filming for the Discovery channel documentary “Return of the Great White Serial Killer”. The Shark Research Committee had collected DNA samples from shark attacks victim’s surfboards from tooth fragments left behind in the objects. Our goal was to collect DNA samples from sharks at Guadalupe and by using the latest technology, discover if there was a genetic link. The show was a great success which has spawned two sequels and the study is on going to this day as our team continues to collect samples for Ralph. 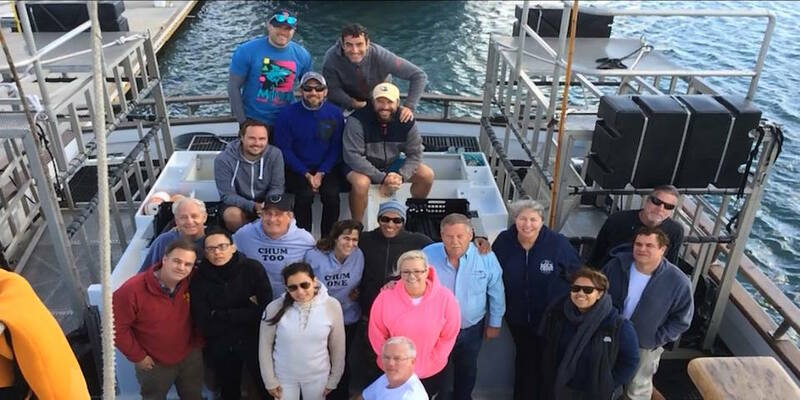 Following up on the success of the 2015 expedition, SDX and the Shark Research Committee ran a second expedition to the Island in late November 2016. We hosted this particular expedition at this time specifically to target the big female White Sharks that can be seen frequently at this time of the season. As well as seeing many of our male sharks the highlight of this trip was interacting with the 16ft “Bryn Penny” a girthy female that was first identified as recently as 2015. With back to back highly successful trips behind us, we are pleased to announce that we will once again be running a special expedition again this November. Like last year, we have scheduled the 5 day trip at what is typically a fantastic time to see the big females at the island. If you are interested in joining the expedition then get in touch soon as places are very limited. The team looks forward to many future collaboration’s with Ralph and the Shark Research Committee.